Disclaimer: Magic: The Gathering is TM & © 1993-2013 Wizards of the Coast LLC in the U.S.A. and other countries. Baby Steps is not affiliated with or endorsed by Wizards of the Coast. It exists for personal use only, and is not for profit. Baby Steps is not an official Magic set. It is a fan set. 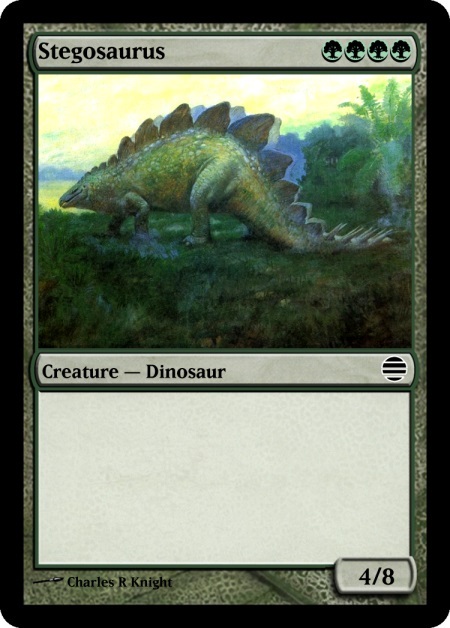 All of the images used for the cards should be in the public domain, but the card templates and mana symbols are TM & © 1993-2013 Wizards of the Coast. If you see an image that is not in the public domain, you can let me know. You can contact me using a form on my About page. Magic: the Gathering is a card game that represents a story generally involving two spell-casting demigods who create their own armies and artifacts from a collection of spells. Players construct their own deck of spell cards that they use to defend themselves and defeat their enemies. Sometimes all players create decks using the same “card pool” and sometimes they collect the cards on their own. Baby Steps is a fan made Magic set made to teach people how to play Magic using multiple levels of difficulty. The beginner level of Baby Steps is a much easier way to play (or perhaps the easiest). There were some “beginner” level Magic sets made in the past called Portal, but even Portal was much more complicated than the beginner level of Baby Steps. I wrote this rulebook that can be used with the beginner version of Baby Steps, which is only six pages (much less than the hundreds of pages that real Magic uses). Teach Magic to Kids Using Baby Steps (Fan Set) — A little about how it was made from the design perspective. Baby Steps 2: The Intermediate Level — The cards and rules. This entry was posted in game and tagged fan set, magic the gathering. Bookmark the permalink.